Police say the New Jersey teen who tweeted that someone was in her home, asked her followers to call 911 and then disappeared likely left her house voluntarily. Kara Alongi gained thousands of followers after asking people on Twitter to call 911 on Sunday because an intruder was in her home. She then went missing, sparking fears that she may have run into foul play. People re-tweeted her message and #helpfindkara trended on the social network. A preliminary investigation suggested that no foul play was involved in her disappearance. Investigators later discovered that someone had called a local taxi company at about the time the tweet was posted. Police say the driver who responded to the Alongi home positively identified the 16-year-old girl as the fare he picked up. He told police he drove her to the Rahway train station. Police Chief Alan Scherb said her apparent disappearance remains a missing person's investigation. "Kara might feel that she will be in trouble if she comes home after this scare and causing a panic," Scherb said in a statement. "At this point, all everyone cares about is seeing her safe and at her house where she belongs." Police responded to Alongi's home on Hall Drive in Clark Sunday evening. A person who answered the phone at the girl’s home quickly said ‘No comment” and hung up. 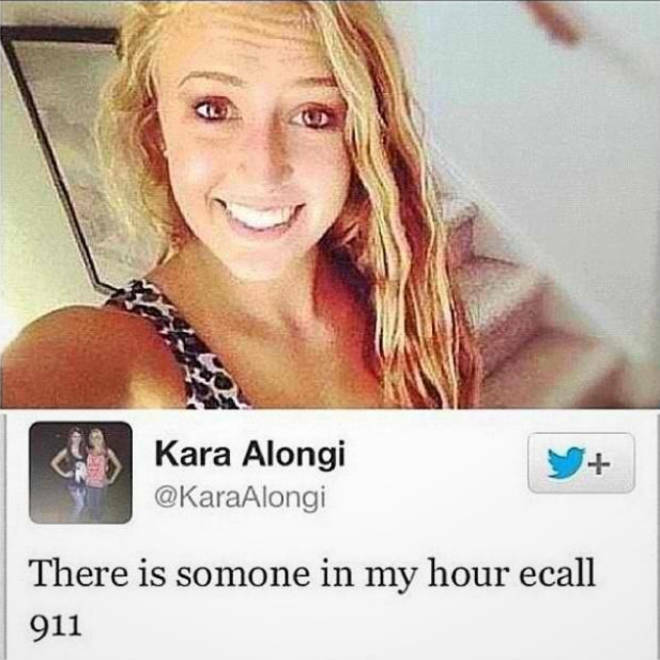 On Sunday, Kara Alongi, 16, tweeted that someone was inside her house, asking people to call 911. Now, her parents are staying quiet and police are saying the New Jersey teen is missing. NBC's Katherine Creag reports. Twitter users worldwide tweeted messages of good will @KaraAlongi overnight as her initial post asking for help circulated. Many said they were frightened to think about what could have happened to her. Others were skeptical about her pleas for help, pointing out a tweet that allegedly popped up on Alongi's account that said: "Why is everyone saying I'm missing? I was jkin haha" and was deleted a short time later.